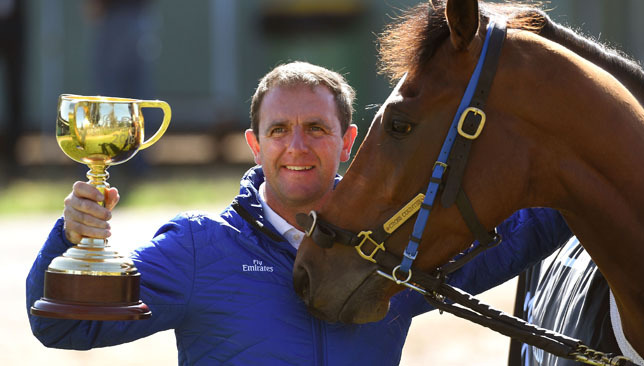 Cross Counter capped an “amazing” year for trainer Charlie Appleby and Godolphin as he became the first British-trained winner of Lexus Melbourne Cup at Flemington. The three-year-old’s victory added another feather to Appleby’s cap with the trainer having sent out Masar to win the Derby at Epsom back in June in the blue silks of Godolphin. Here, we take a look back at the Southampton native’s five finest moments of 2018. The long wait for a first Investec Derby winner finally came to an end in June after Masar provided Sheikh Mohammed bin Rashid Al Maktoum with the victory he has craved at Epsom. The Charlie Appleby-trained son of New Approach showed he had the potential to strike at the top table, crossing the line a length and a half clear of Dee Ex Bee. Blue Point gained a breakthrough first G1 success with a scintillating display in the King’s Stand Stakes over five furlongs at Royal Ascot in June. The four-year-old colt showed good early speed from the gates, stayed composed and finally put the foot down in the final half-furlong to prevail by a length and three-quarters on good to firm ground. It was Appleby’s first G1 winner at Ascot. Appleby’s year got even better in Australia last month. The 43-year-old saddled his first Group 1 winner Down Under as Jungle Cat won the Sir Rupert Clarke Stakes at Caulfield in Melbourne. The high class six-year-old, ridden by James Doyle, beat Dollar For Dollar by a short-head, with Home Of The Brave fourth for new Godolphin trainer James Cummings. The two-year-old colt added further lustre to a year to remember for Appleby with victory in the Breeders’ Cup Juvenile Turf. Buick’s mount looked beaten at one stage, but picked up bravely to get the better of Uncle Benny. A tense wait ensued, but the placings remained unaltered. Appleby was recording his third career win at the meeting from just five runners. The two-year-old filly was the worthy winner of the G1 Natalma Stakes at Woodbine in Canada last month. La Pelosa, stepping up to a mile for the first time, made progress half-way and was fifth at the turn. She continued to improve her position and challenged for the lead with a furlong left. The sire of Dandy Man soared to the front late on, winning by a length on firm going. 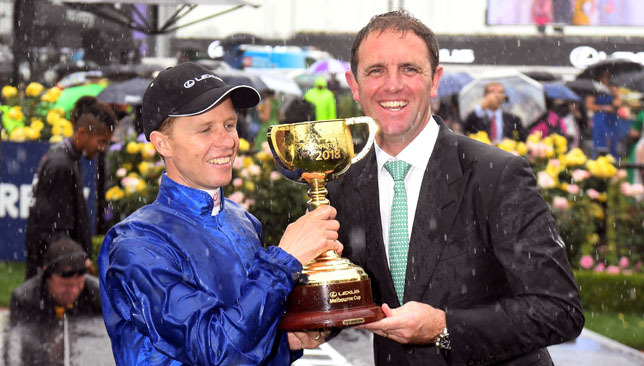 Cross Counter capped an “amazing” year for Godolphin trainer Charlie Appleby as he became the first British-trained winner of Lexus Melbourne Cup at Flemington. The three-year-old was delivered with a perfectly-timed run by Kerrin McEvoy to claim the Group One prize and lead home a famous one-two-three for the raiding party, with Hughie Morrison’s Marmelo a length back in second and the Charlie Fellowes-trained Prince Of Arran a further three lengths behind in third. 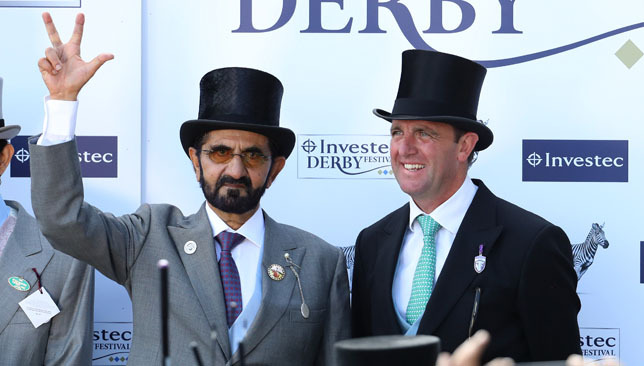 Cross Counter’s victory added another feather to Appleby’s cap with the trainer having sent out Masar to win the Derby at Epsom back in June in the blue silks of Godolphin. The trainer said: “This is all down to Sheikh Mohammed, he’s the one that’s given us all the encouragement to take the chances in what we do internationally. “When I saw him down the back, I thought he had to do a lot. Godolphin has hit the bar in the past with the likes of Give The Slip, Crime Scene and Central Park all having placed in the main event and Appleby himself is a previous visitor to Melbourne. He told www.godolphin.com: “We’ve been competitive, but we’ve learnt more on each trip about what will make us more competitive. That’s what it’s all about, the learning curve.